Melissa has a passion for offering sustainable Yoga that meets you where you are today, just as you are. Through the transformative power of Yoga and travel, she offers experiences that are accessible to every body by teaching to the unique needs of the students in front of her. Yoga retreats allow us to be immersed into other cultures, so that we begin to see clearly our uniqueness as well as our similarities. Through these fun and transformative adventures, Melissa draws out in a unique way, a sense of community, restoration and the ability to see and appreciate the beauty in each moment. Having lived and traveled all over the US, in Asia (Kuala Lumpur, Malaysia), and most recently residing in Calgary, Alberta Canada. Yoga Alliance ERYT® 500, she currently travels between Texas, Calgary and Asia, leading retreats, teacher trainings and immersions, specializing in Restorative Yoga and Sustainable-Therapeutically based Yoga. Melissa’s slow-flow, therapeutic and restorative-based Yoga classes offer a uniquely nurturing perspective on life. Also a Thai Yoga Massage Practitioner and AcroYoga® Level 2 Certified Teacher, Melissa uses these community building tools to build trust, awareness and bring out a sense of playfulness in each of us. Melissa is the author of Pregnancy Yoga, A Simple Illustrated Guide to Self Practice for Both Pre and Post Natal, Published 2008. She is an ambassador and contributor for Yoga + Mantra Magazine, writer for Elephant Journal and Rebelle Society. 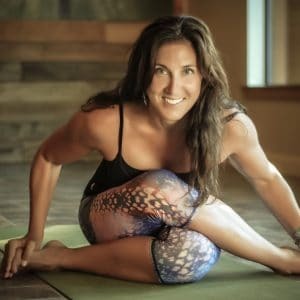 Passionate about building connections, community and giving back through Yoga, she’s the founding ambassador for Houston, Texas’ Breakfast Yoga Club, which builds friendship and cohesiveness within the Yoga communities while drawing awareness to various charities. Melissa is a speaker and advocate for research for a non-profit Alzheimer’s Group and holds an annual Caregiver’s of Alzheimer’s Retreat to offer respite and to raise awareness for Alzheimer’s near Houston. She was a part of a team who raised funds to build a school and a library for the Bali Children’s Project, a non-profit devoted to providing educational resources to rural Balinese children and leads an annual Yoga and service trip for High Schoolers who devote a week to working with children on literacy and raising awareness and appreciation for cultural diversity. Find out more about Melissa on her Website, Twitter, FaceBook or Instagram feeds.